Adrian Pilkington (pictured) has taken the newly created role of senior vice president, distribution and strategy, at A+E Networks. Pilkington will oversee the strategic planning and execution of branded channel and digital distribution across the UK, Nordic, the Benelux and CEEMEA. Bexel Global Broadcast Services has continued its international expansion of services in the EMEA market and announced a team of new staff to lead and grow the newly formed EMEA division. Richard Satchell, former CEO of Autocue, has been appointed managing director; Neil Coles, formerly of Pinewood Studios, has joined as head of business development; and Jonathan Endley, previously with SIS Live, is the division’s business development manager. Media localisation and access services provider BTI Studios has hired Julia German as director of international vendor management. German has eight years’ experience in media localisation and has held a number of positions in companies including Lionbridge, SDI Media and VSI. She joins from Hit Entertainment where she served as foreign language dubbing supervisor. Industry veteran Rainer Hercher has joined CW Sonderoptic as general sales director for its line of Leica-branded cine products. “Rainer brings a rare depth of experience and understanding of the global cinematography market that is invaluable for growing our business,” said Gerhard Baier, MD of CW Sonderoptic. EditShare has a new senior VP of worldwide business development in Harvey Kohli (pictured). Kohli’s experience has included key development roles at ATTO, Data Direct Networks and more recently at Panasas where he led the company’s push into the M&E sector. Test equipment rental provider Electro Rent Europe has appointed two industry experts to key positions within its new UK office. Mike Sullivan becomes business manager, UK, and StephenSkinner has been appointed account manager. The appointments follow the recent opening of Electro Rent Europe’s UK office, which will provide customers with localised stock and support. Wim Ponnet (pictured), has joined Endemol Shine Group as director of strategy and commercial development. Ponnet joins from Yahoo EMEA where he has been senior director, strategy and operations since 2011. The Group has also hired Georg Ramme as global managing director of the company’s global digital video network, Endemol Beyond. Ramme initially started up Endemol Beyond’s first-ever hub in Germany in 2012, which he continues to lead as MD. Friend MTS has enhanced its video content protection solutions with the appointment of OTT specialist Rob Brown to the position of senior solutions architect. Broadcast services specialist Gearhouse Broadcast has appointed David Phillips as business development director for its Systems Integration division. Phillips, who spent ten years as managing director of TSL, will focus on expanding Gearhouse’s list of SI customers around the world. He will work closely with Eamonn Dowdall, business development director of Gearhouse’s parent company, Gravity Media Group. Stan Moote has been appointed to the position of CTO at the IABM. Moote was involved in the SMPTE Digital Video Standards Committee meetings creating CCIR-601 and continued his standardisation work on video transport by being on the VSF board of directors, Video Services Forum, 2001 to 2004. James Smith, previously with Rightster, has joined InPlayer as head of sales to lead the company’s drive into the UK sports industry, building on the success and adoption of the InPlayer paywall technology in the US sports video market. 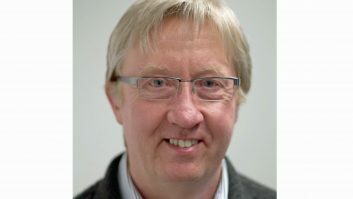 Leader Instruments has added of Kevin Salvidge (pictured) to its team, as European regional development manager. Based in Britain, he will be working alongside market development manager Koichi Fukagawa in expanding Leader’s product distribution base. Root6 Technology has appointed Simon Pegg (pictured), to the role of software architect. Pegg brings more than 16 years’ experience in the broadcast area, most recently serving as senior software pipeline architect at California-based Wohler Technologies working on RadiantGrid and Tachyon Wormhole solutions. Prior to that, he worked at UK-based Eyeheight for 13 years as R&D director. David Nortier has been promoted to head of sales for north Europe, Sony Professional. Bringing more than 20 years’ experience to the company, Nortier will be responsible for the UK, Ireland, Benelux and Nordic country sales. Joining Sony in late August 2015, Nortier takes over from David Cheesman. Wise Buddah’s senior talent manager Sam Gregory is leaving the company to start a new agency, Big Red Talent, and has purchased part of the Wise Buddah Talent roster. Work Microwave, a European manufacturer of satellite communications, today has opened a new office in Tucker, Georgia to broaden the company’s market reach across the Americas. WaylonSun has been appointed as vice president, business development and sales. Finally, facility management software creator Xytech, has welcomed Neil Neusten to the company as director of EMEA business development.